The most exciting two minutes in sports. The run for the roses. The first leg of the triple crown. 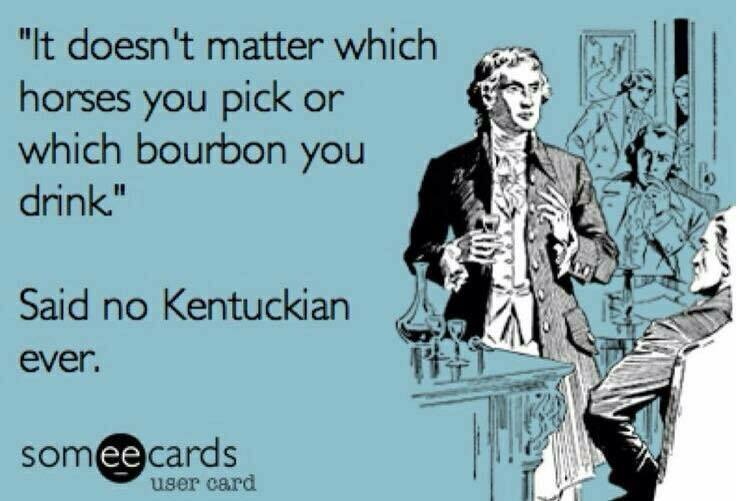 The Kentucky Derby. 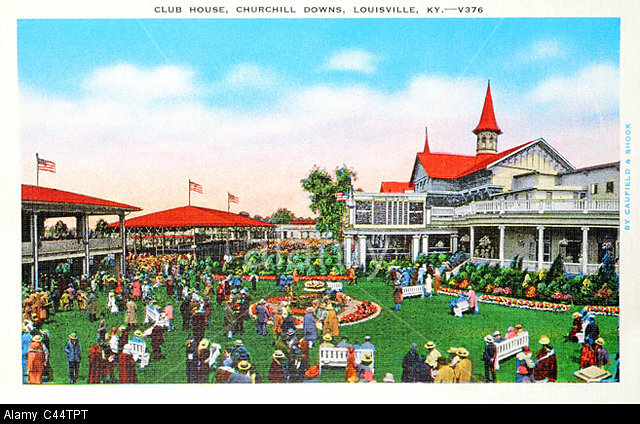 The pride of American horse racing has been run consecutively every year on the first Saturday in May since 1875 in Louisville, Kentucky, at a track called Churchill Downs, famously known by its twin spires. 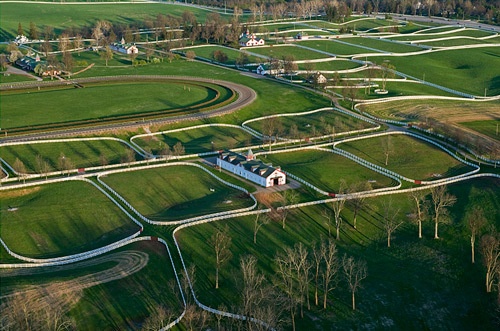 The Kentucky Derby may be the most famous thoroughbred race in the world (OK: it IS but I don’t want some English “Darby” fan to give me a hard time) but some of history’s most famous thoroughbreds never raced in the Derby. Would it surprise you to know that renowned twentieth century champions Man O’War and Seabiscuit neither raced in the Run for the Roses? 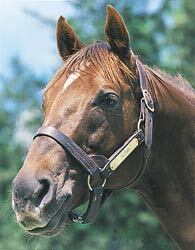 From Secretariat, by William Nack. The end of the race was primarily between horses Shecky Greene (jockey Larry Adams), Sham (ridden by hall of fame jockey Laffit Pincay Jr) and Secretariat. Turcotte took Secretariat back toward the gate. He reached to his helmet and pulled a pair of plastic goggles over his eyes. A starter came to him again, reaching out. The starter’s hand gently touched the extension of the bit. Feeling the hand, the colt settled down at once. The last horse – Gold Bag – settled into the gate on the far outside. [Secretariat’s jockey Ron] Turcotte reached down and grabbed a full handful of Secretariat’s mane, holding it to keep his balance at the break, and he bent forward in the fallen stillness.
. . . Secretariat now lay fifth. So far his move had carried him from last to fifth, and it left him only six lengths behind Shecky [Greene] as they went to the half-mile pole at the far turn. Shecky had a length and a half lead on Sham, racing the six furlongs in 1:11 4/5, almost six twelves in a row. 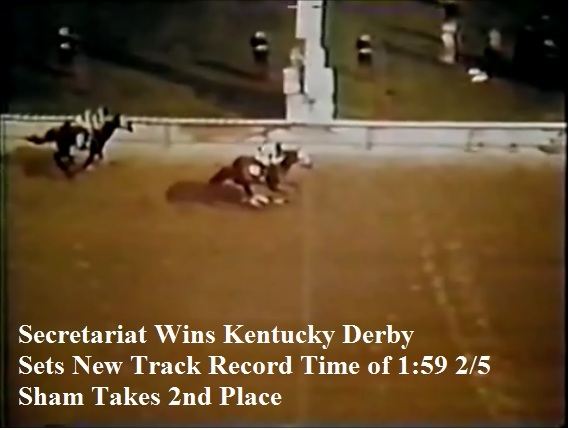 He had not let up a moment since the break. . . . Secretariat raced the first three-quarters in 1:03, which put him four lengths behind Sham. He had dead aim now, Turcotte felt, and he was still running powerfully beneath him, breathing well at the turn, inhaling and exhaling rhythmically. Turcotte’s only hope now was that the colt would have something left for the final quarter mile down the lane. If he keeps running like this, Turcotte thought, I won’t have to ask him until the quarter pole. . . .
Secretariat moved to Sham at the top of the lane. This was what the thousands had been waiting for. They were all on their feet-deafening and growing louder as Secretariat and Sham raced through the top of the straight, Turcotte pumped and pumped again. He was riding hard. He threw all his weight and strength into building the colt’s momentum, driving his arms and torso forward at the forward thrust of Secretariat’s reaching stride. Sham was in front by a length beyond the quarter pole. Pincay had still to draw his stick. He had been hand-riding Sham, and he was confident passing the quarter pole and ito the upper stretch, which is where he thought he felt something on his right. He did not hear or see it; rather he felt it there, and so he looked under his right arm and all he recalls seeing were the blue and white checked blinkers and the massed brown of Secretariat’s neck. He was about a half length away. Secretariat then changed leads for the fourth time in the race, from left back to right at the top of the lane, and now he moved to to Sham, picking up momentum again. He cut the martin to a half length and then a neck as they drove to the three-sixteenths pole. Turcotte and Pincay rode furiously, alternately pumping and going to the whip. They switched their sticks from the right to the left hand. 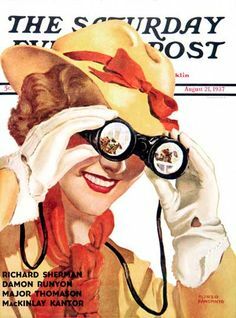 They muscled Sham and Secretarial down the stretch, tow of America’s strongest riders leaning and lifting together, while the dome of the grandstand rocked with noise at the sight of it. Slowly, digging in relentlessly, Secretariat gained ground on Sham through the upper stretch, and by the three-sixteenths pole he had come to Sham to swallow him and then they were nose and nose. Together they drew away from the field. Churchill Downs vibrated to the spectacle of it. In the end, Secretariat won setting a record for the race that has never been broken. It is a monumental example of the beauty of the sport. Here’s a youtube video of the 1973 Kentucky Derby race in full: https://youtu.be/74Usj3K4oZ0. For much of the race Alydar trailed. But as he turned for the homestretch and began to pass, one by one each of the other horses, Lucille and Gene [Markey, Alydar’s owners] were helped out of the car and taken to the rail, where they watched Alydar win the race by thirteen lengths. As his victory was confirmed and announced, Lucille moved slowly toward her husband and pressed her cheek against his. Here’s the Kentucky Derby video of Affirmed and Alydar: https://youtu.be/55_vvvCLjQU. I must admit, every time I watch, I want Alydar to win. If you aren’t attending the Derby, your day is all about entertaining at home and I’ve got all the recipes you need. I know, I know: You want Mint Juleps. I located a 1982 sports article quoting the late wife of former Kentucky Governor A.B. 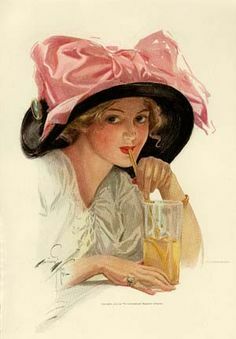 “Happy” Chandler as saying mint juleps were “horrible stuff.” The article called her Millie. Her granddaughter, Erin, happens to be an acquaintance of mine and fortunately, provided me the following update! I don’t know who Millie is but I scanned the article and apparently they were MIS quoting my grandmother, Mammy (Mildred Watkins Chandler… NEVER referred to as millie!!) my grandfather never had a drink in his life and I doubt Mammy advertised a special recipe for Mint Juleps… she did love a Whiskey Sour though!! Dissolve the sugar in the water in an old-fashioned glass (or julep cup, of course). Add the mint leaves and press them lightly with a spoon — you want to seduce the oil from the mint leaves, not beat it out of them. Add the bourbon, fill the glass with cracked ice, and stir. Plant the mint sprig in the ice alongside a short straw, and serve. Pack ice into six julep cups to within 1/2 inch from top. Add 1 jigger sugar syrup and 1-2 bourbon to each cup, stirring until each cup frosts. Dip mint sprigs into powdered sugar and place 1 in each serving. Serve with a cocktail napkin. Sugar syrup: 1 cup sugar, 1 cup water, 1 bunch fresh mint. Bring sugar and water to boil in small saucepan, stirring until sugar dissolves. Remove from heat and add mint. Cover and let steep for 15 minutes, stirring occasionally. Drain, discarding solids. The other absolute essential is a chocolate/bourbon/pecan pie creation that used to be called “Derby Pie,” but now cannot be called “Derby Pie,” anymore because some huge corporation bought the rights to the name “Derby Pie” and now the only pie than can be called “Derby Pie” is said corporation’s “Derby Pie” thus ensuring that a) I will never tell you what corporation that is; and b) I will never buy one. Preheat oven to 325. In a small saucepan, combine sugar, corn syrup and butter. Cook over medium heat, stirring constantly, until butter melts and sugar dissolves. Cool slightly. In a large bowl, combine eggs, bourbon, vanilla and salt. Mix well. Slowly pour sugar mixture into egg mixture, whisking constantly. Stir in chocolate chips and pecans. Pour mixture into unbaked pie shell. Bake 50 to 55 minutes or until set and golden. I serve with home made whipped cream topped with mint. Or vanilla ice cream. The only other thing you really need for a Derby party is a hat. But feel free to add some County Ham and biscuits, Bourbon balls, fresh asparagus with hollandaise, strawberries with whipped cream, corn pudding . . .. OK: I’m hungry. Happy Reading & Eating & Betting!